BARBERVILLE, FL – For the first time since 2007, Tim Fuller parked his Super DIRTcar Series Big-Block Modified on the front stretch at the Volusia Speedway Park as a feature winner. The Edwards, N.Y., driver drove his familiar No. 19 to the win in the opening 30-lap feature for the Modifieds as part of the 45th Annual DIRTcar Nationals. Fuller started on the inside of the second row and wasted little time in moving to the front. Fuller grabbed second early before using a restart in the first third of the race to drive around opening lap leader Tyler Dippel. From there, Fuller survived numerous restarts and challenges from long-time friend Billy Dunn to earn his sixth career win at the speedway. Tyler Siri and Dippel shared the front row of the start of the 2016 Big-Block Modified season with Dippel charging by Siri for the lead at the exit of turn two on the bottom of the opening circuit. Siri looked for a way back by the Wallkill, N.Y., teenager but as he looked for an advantage Fuller found the fast line and drove into the runner-up spot. Once he got to second, Fuller moved up to the top groove with his Enders powered Bicknell while Dippel continued to try and make laps on the bottom. This allowed Fuller to work his way by Dippel for the lead on lap six. Before another lap could be completed, Siri brought out the first caution of the night as he slowed with a flat tire. Fuller elected to use the outside of the front row for the restart and he blasted into the cushion to hold off Dippel. Dippel meanwhile had his hands full with Dunn. Dunn drove by Dippel on the top, securing the second spot as they came off of turn four. As Fuller paced the field, the action behind him and Dunn picked up with Dippel, Billy Pauch and Larry Wight all battling for the third position. Pauch was able to fend them off each time to hold onto third. By the time the race reached the midway point, Fuller had extended his lead over Dunn and began to work slower traffic. He stayed on the upper portion of the speedway with Dunn in tow. Pauch remained third with Dippel and Wight getting together. This caused Dippel to catch the wall off of turn two. Dippel stopped with a damaged race car necessitating a second caution. Dunn gave Fuller all he could handle on the restart as he looked down low and slid up the speedway to pull alongside of Fuller as they exited the second turn. They remained that way all the way down the backstretch before Fuller barley cleared him on the top of turn three with Dunn trying to keep pace off of four. Fuller pulled away from that point. He blasted the cushion harder and harder each lap increasing his lead over the Dunn. That lead was negated one final time on lap 23 as Eldon Payne’s car blew a right rear tire which caused him to slow in turn three. Dunn and everyone else had one more shot at Fuller on the restart. Fuller made sure that he wasn’t going to be denied as he drove into one and caught the cushion perfectly running away from the rest of the competition. Dunn remained in second by himself while Pauch and Wight renewed their battle for the final spot on the podium. Fuller took the checkered flag nearly three seconds in front of Dunn. For Dunn, of Watertown, N.Y., it was a good night considering he had never turned a lap at the track prior to Tuesday night’s practice session. Dunn had one chance where he could have thrown the slide job on Fuller and it may have been possible for him to take the lead and keep it. He did not pull it off forcing him to settle in for second. Pauch, of Frenchtown, N.J., finished in the third positon after starting the main from the outside of the second row. Pauch tried to get in the mix early for the lead but settled in to the third position as the race became a battle for the preferred line on the cushion. It was his ninth career third place finish at Volusia. 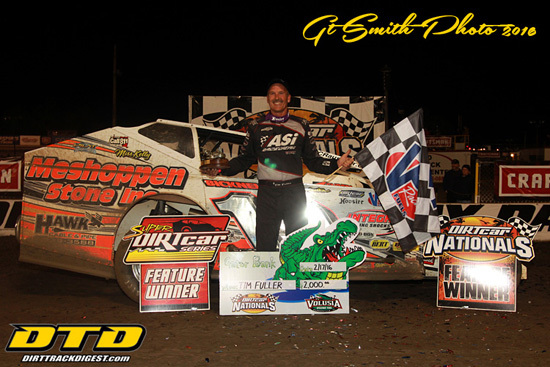 Wight, the 2015 DIRTcar Nationals Big-Block Modified champion, finished in the fourth position while defending Super DIRTcar Series champion Matt Sheppard completed the top five. Heat race wins went to Siri, Dippel, Fuller and Pauch with Jamie Mills and Danny Johnson each earning a pair of victories in the consolation events. Racing returns Thursday night at Volusia Speedway Park for the 10th day of the DIRTcar Nationals. Gates open at 5 p.m. and racing begins at 7:30 p.m. The Super DIRTcar Series and DIRTcar Racing in the Northeast is brought to fans by many important sponsors and partners, including: Hoosier Racing Tire (Official Tire), VP Racing Fuels (Official Racing Fuel), Chevy Performance Parts and NAPA Auto Parts; in addition to contingency sponsors, including: ASI Race Wear, Bicknell Racing Products, Bilstein Shocks, Cometic Gasket, Comp Cams, Edelbrock, Fox Shocks, Intercomp, JE Pistons, JRI Shocks, KSE Racing Products, Mike’s Racing Heads, Motorsports Safety Systems, MSD, Mobil 1, Superflow Dynos and Wrisco Aluminum; along with manufacturer sponsors, including: Beyea Headers, Racing Electronics and TNT Rescue.